Last night National Volunteer Week started with a beautiful event at the National Arboretum. 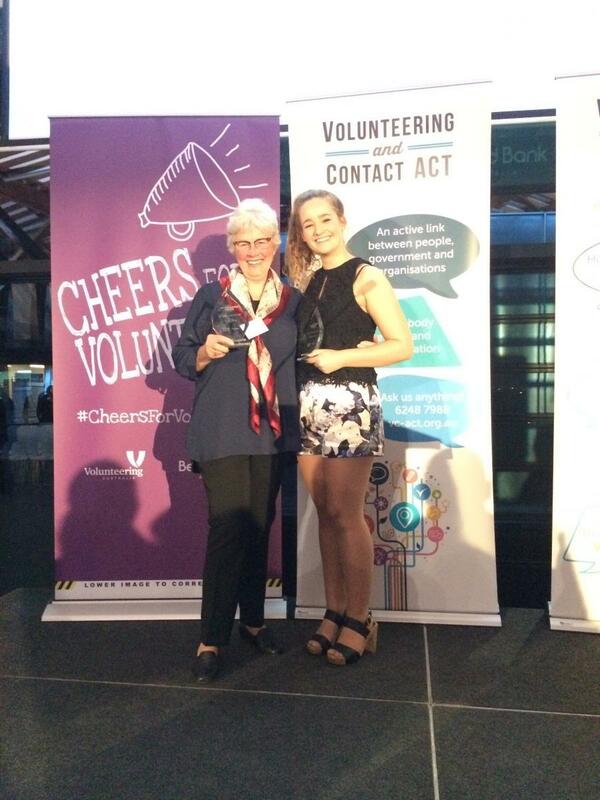 Volunteering and Contact ACT hosted the 2017 Volunteering Awards, Canberra Region. With a record number of nominations, more than 200 guests gathered to recognise Canberra’s best volunteer services. Across nine categories more than 50 individual volunteers and volunteer teams were acknowledged for their outstanding contribution. Vinnies Canberra/Goulburn nominated several individuals and teams in this year’s awards. These included Blue Door drop in centre, Calwell Conference, Kambah Conference, Linda Barry and Kate Barton. With much excitement we are proud to announce that two of our nominees were successful, with a Vinnies volunteer winning two of the nine categories. Both a strategic contributor and a grass roots volunteer, Linda Barry has been delivering value to St Vincent de Paul since 1991. Through her contribution, Linda has helped helping tens of thousands of people in need. This has been through her board representation, senior management of 25 Vinnies shops, and one-on-one assistance and advocacy. Linda continues to do whatever it takes to give people in need a “hand up”. For 26 years Linda, has responded to the Vincentian call to action and asked the question daily “What Must Be Done?” to alleviate poverty, and to address the needs of vulnerable people in our community. On any given day, Linda could be supporting a person in crisis or leading the biggest Vinnies Centres restructure in the history of the Canberra/Goulburn Society. Kate has volunteered thousands of hours with St Vincent de Paul since she was 16 years old. In addition, Kate is the Youth Representative on the board of the St Vincent de Paul Society, a member of the Society’s National Youth Team and a volunteer with the two Vinnies Youth Programs in Canberra. In her time volunteering with the Youth Programs Kate has worked with hundreds of vulnerable children, providing them with the care and respite they desperately need. Kate’s tireless volunteer work is a wonderful example of a program that is run by young people, for young people. She is a role model whose gentle and caring nature enables the children, who are often traumatised through family histories of abuse and neglect, to feel safe and secure on the camps she runs. Kate can regularly be found on camp having conversations with kids about what their hopes and dreams are. Congratulations to Kate, Linda and all the nominees. To see the winners of each category please click here.